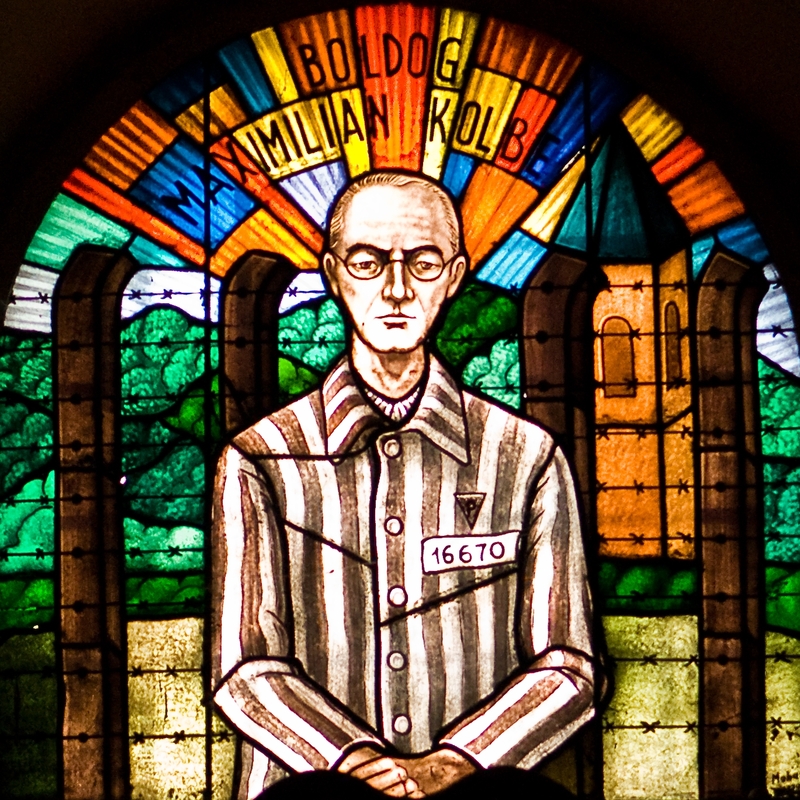 Maximillian Kolbe was born Rajmund Kolbe in part of Poland that was, at the time, part of the Russian empire. His father--Julius--and mother--Maria--moved the family around in an attempt to find both freedom and a measure of stability. They worked a variety of jobs before Julius enlisted in a Polish force that hoped to fight and gain the independence of Poland from Russia. Rajmund and one of his brothers decided to become priests and did so by sneaking across the border into Austria-Hungary. There, they studied in seminary in preparation. When Rajmund took the vows that began his process of becoming a priest, he changed his name to Maximillian. This was, in a way, a new birth into life that was free of Rajmund's fear of the Empire and the oppression it so easily dealt in. It was a turning point for Maximillian. Eventually, Maximillian would be ordained a priest and he would return to Poland. However, now Poland was a free nation andMaximillian was a spiritual leader who knew how best to resist an Empire. This would come in handy when, years later, the Third Reich began to sweep into Poland bringing death and destruction to Jews, outcasts, and those who resisted the Empire. Maximillian used the radio station he had founded and supervised to vilify the encroaching Nazis. Further, he used the resources and buildings at his disposal to provide shelter and sanctuary to more than 2,000 Jewish refugees. He refused to submit to an Empire that demanded submission or torturous death. This kind of resistance to the Empire was, is, and will always be noticed by the powers. Consequently, the Gestapo came--hiding behind their titles and uniforms that were supposed to make their evil actions legitimate--and arrested Maximillian. He was shipped to prison and, then, to Auschwitz. They tried to strip him of his identity. They did not call him Maximillian--his chosen Christian name. They did not call him Rajmund--the name his family had given him. They called him prisoner #16670. They hoped that they could quell this resistance by crushing the spirit of one who refused to submit. Whereas they could have used their power and simply killed him, they hoped to crush his will and make an example of him. In the case of Maximillian, they failed. Eventually, one of the men in Maximillian's block was found missing. The Nazis were enraged at the idea of a person escaping their exquisitely crafted hell and their rage flowed out in a series of commands: ten random people from that block would forfeit their lives as punishment--by starvation in a locked bunker. They rounded up ten men and paraded these condemned ones before the inhabitants of Auschwitz. They proclaimed the cause of their death--the "missing" man who would later be found dead in a latrine--and hoped to spread fear through the people like a poison to destroy their hope and capacity for cooperation with each other. The Empire dealt in terms of death and was skilled at wielding it willfully. One of the men--Franciszek Gajowniczek--cried out in fear and desperation for his wife and children that he would leave behind. The hearts of the Nazis were not moved but the heart of Maximillian was. Maximillian stepped forward and volunteered to die in the man's place. Maximillian--lover of life that he was--hoped to purchase the life and future of another man with his own excruciating death. The Nazis agreed to this for whatever reason and led the ten men into a bunker, locked the door, and gave the men over to death and desperation. Maximillian led the condemned in songs and prayers while they slowly died from starvation and dehydration. After three weeks of torturous death, Maximillilan and three others were still alive and still singing and praying. They were weak and they were, most assuredly, dying and yet they were offering love to their executioners. The guards removed them from the bunker and injected them with carbolic acid. They died there on August 14th, 1941. Though the Nazis dealt in death and believed themselves powerful, Maximillian dealt in love and life and knew the true power of a redeemed heart willing to make sacrifice for another.Maximillian died that day but he resisted and defeated an Empire that couldn't begin to comprehend the redemption and conversion at work in Maximillian.